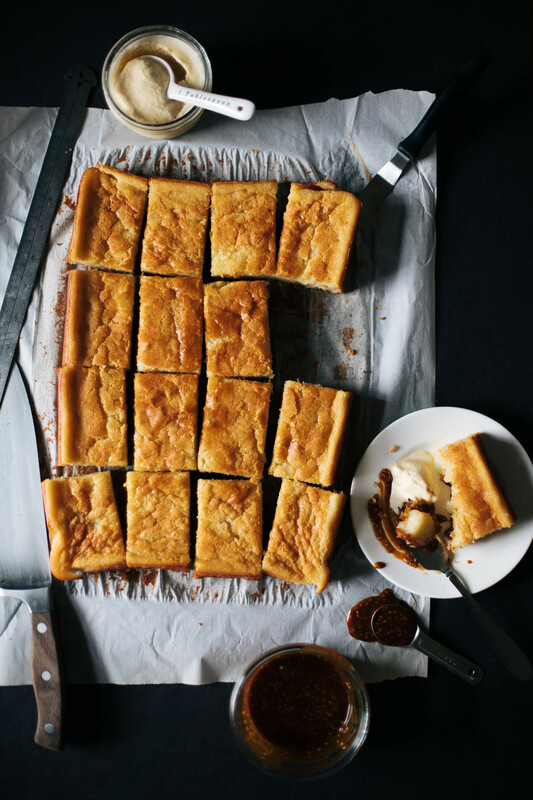 Butter Mochi — always with butter. Oven 350 degrees F. Line a 9x12 baking sheet with parchment paper. Whisk the milk, coconut milk, butter, eggs and vanilla together. In a separate bowl whisk the sugar, flour and baking powder together. Slowing add the dry to the wet, mixing until there are no lumps. Pour into the prepared pan. Bake for about 1 hour, until the top is golden and it is puffed up. Let cool completely. Put the sugar and cream of tartar in a saucepan and place over medium high heat. Swirl around to make sure the sugar is melting evenly. Cook until a deep golden color. Take off the heat and quickly whisk in the tahini and butter. Then the heavy cream. If it begins to separate, put back over low heat and whisk until it comes together. Stir in the sesame seeds and salt. Let cool a bit before using. Combine the milk, cream and sugar in a saucepan. Whisk together until combined. Simmer until the sugar is completely dissolved. In a separated bowl whisk the yolks, salt and malt powder together. While whisking constantly, add a bit of the hot milk to the yolks to temper. Add the yolk mixture into the rest of the hot milk mix in the saucepan. Cook over medium low, while stirring constantly. Cook until it coats the back of a wooden spoon, 170 degrees F. Cool completely, either in the fridge or in an ice bath. Churn in an ice cream maker then freeze until solid. I have been wanting to make this recipe for over a year now. The ingredients are easy to find, it is not difficult, I just keep making everything else but this. Today was finally the day. And it tastes just like I remember, eating straight out of the package from Foodland on the North Shore. I didn't know what it was. It looked like extremely under baked cake. The person who I was with said to definitely get it. I ate the whole package that night. It is amazing. Not too sweet, chewy, sticky; a texture I had never had before. Have been dreaming about it ever since. The sesame caramel and salted malt ice cream work really well with it. I first was just going to make the sesame caramel, to add a bit of nuttiness and sweetness to the cake. Then Jorge wanted some ice cream, just to eat. He wanted matcha again but i wanted something different. Wandering through the store, I couldn't pick a flavor to make. On the last aisle I saw malted milk powder. That was it. At the near end of taking photos, the ice cream was added in just for fun. Then we tried it all together. Much recommended.